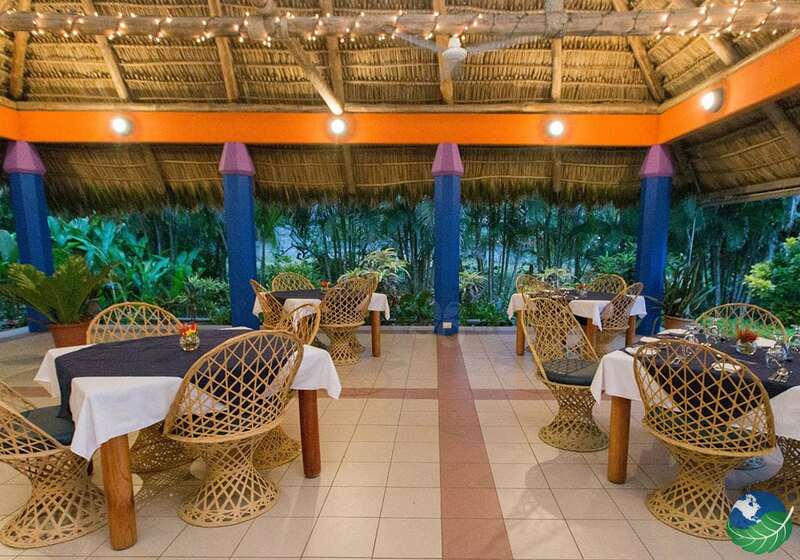 The Alma del Pacifico Hotel conveniently located in the province of Puntarenas. Between Jaco and Manuel Antonio, in the Stunning beach town of Esterillos Este. Known for its fantastic surf and clean breaks. This gorgeous beach is recognized for being one of the best Beaches of Costa Rica. Pristine and untouched, this long stretch is perfect for long strolls or horseback riding, swimming, and sunbathing. The almond and palm trees always provide sufficient shade. While the sunshine is always guaranteed, or almost! 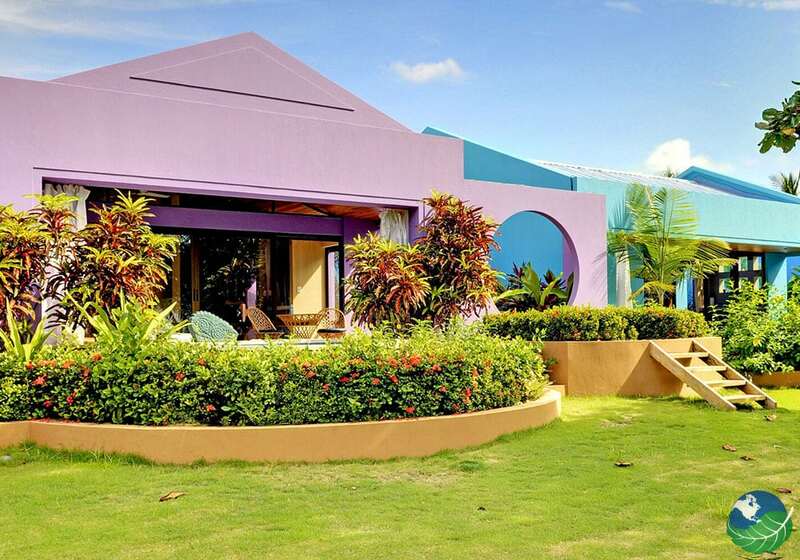 The beautiful hotel will take your breath away with spacious villas. Each decorated with original paintings, mosaics, and tapestries. The long chairs and inviting hammocks are hard to resist after a hard day at the beach! What To Do At Alma del Pacifico Hotel? There is a large variety of activities to choose from in and around the Alma del Pacifico Hotel. All thanks to the many National Parks and Tours of Puntarenas that are only an hour or less away; try the Carara National Park near Jaco, or Manuel Antonio. There are also canopy tours, whitewater rafting, and waterfalls. Go horseback riding, sea kayaking, scuba diving or snorkeling, jet ski or deep-sea fishing. Go on a river crocodile’s safari, or go sailing on a catamaran to visit the wonderful islands of the Gulf of Nicoya. Finally, enjoy the nightlife of the little town of Esterillos. The Spa of Alma has a wonderful choice of therapies and treatments to offer you. Only natural ingredients of Costa Rica are used. Each room has its theme and ambiance with a unique artwork and colors to represent the four elements of air, water, earth, and fire. A real must during your stay at this magical jewel. The Alma del Pacifico Hotel has a choice of accommodations to suit every need and is all equipped with a kitchen, a refrigerator, air conditioning, ceiling fans, hair dryer, iron & ironing board, a CD player, security safe, direct dial telephone and an alarm clock. 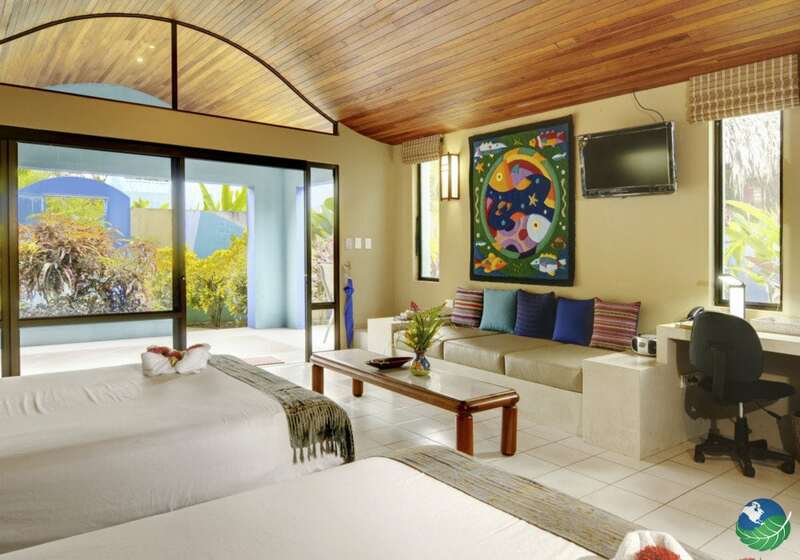 The Garden Villas are the most recent addition and also the most private; located close to the pools; they come with a choice of a king-size or two single beds and a built-in sofa and a spacious patio. 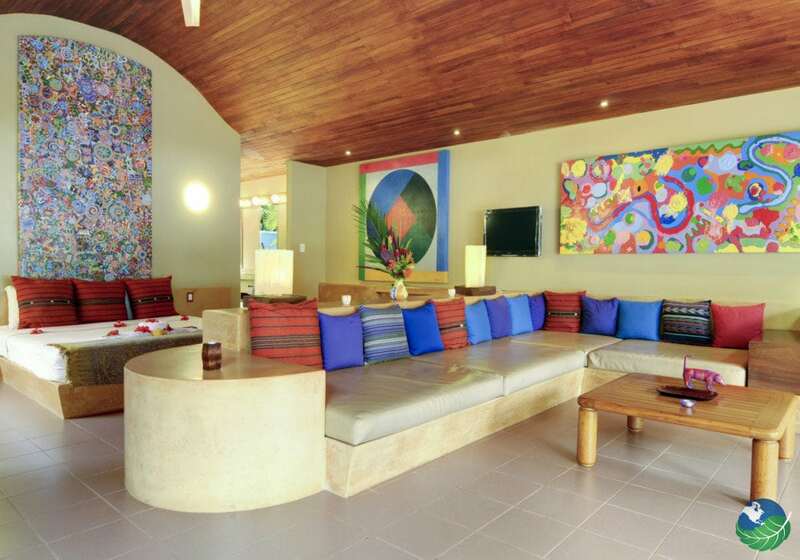 The Beachfront Prima Villas come with either a king-size or two single beds and sofa bed. There is a stunning panoramic view of the Pacific Ocean from their private terrace. The Beachfront Ultra Villas are larger than the Prima Villas. 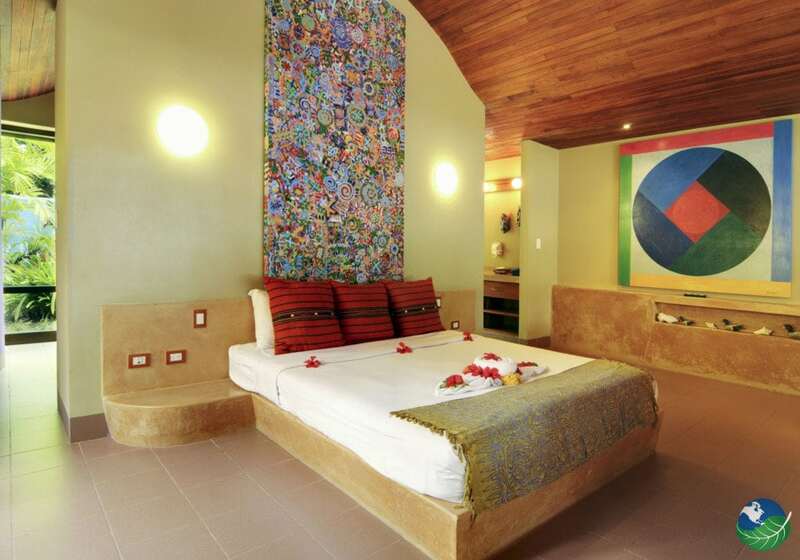 While the Beachfront Ultra Plus Villas come furnished with either a king-size bed. Also, two built-in connecting sofa beds in the living room or with two singles and a built-in double sofa bed. 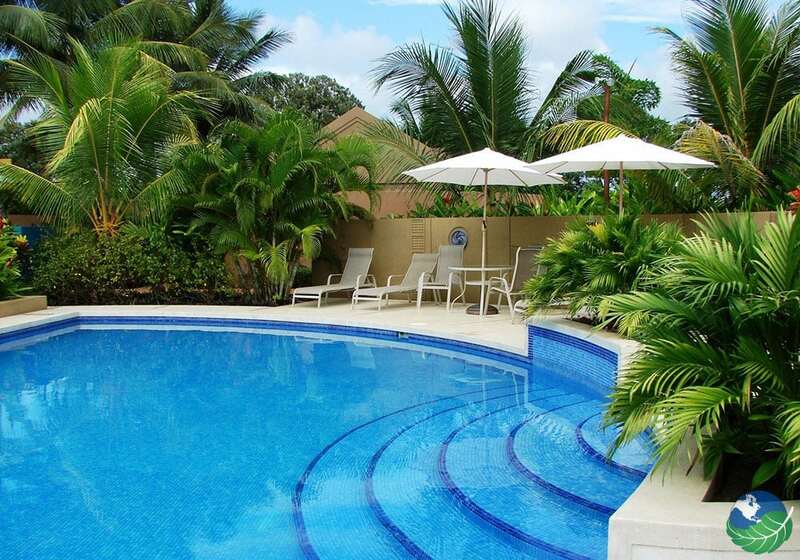 This villa also has its private plunge pool and accessible for disabled people. 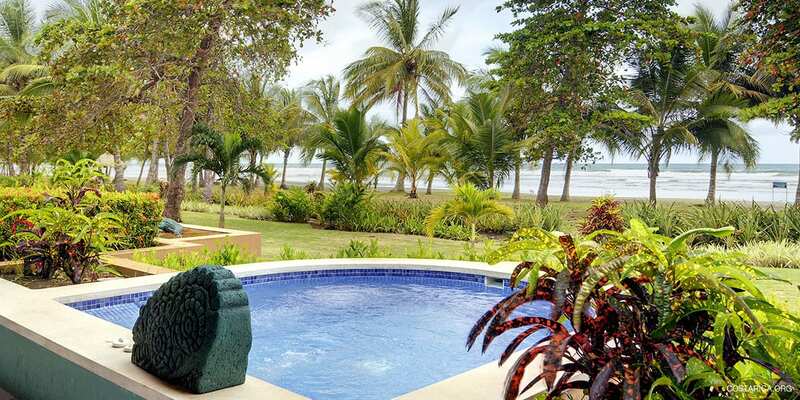 Finally, the Beachfront Maxima Villa, the largest of them all, has a plunge pool on the terrace, a huge living area, with a bar kitchen, and of course, a panoramic view of the sunsets of Puntarenas and the idyllic beach of Esterillos. The Alma del Pacifico Hotel is your perfect choice for a successful vacation on the Pacific Coast of Costa Rica, by one of the most scenic spots of this incredible little country, close to the most magnificent National Park, high surf and out of this world flora and fauna. Come and relax and let yourself be pampered in the spa. Enjoy the pool, or take long walks on this magnificent beach, this is what you had been looking for. While it is still only a couple of hours away from San Jose, there is no better balance, between the wilderness of the jungle, the beauty of the beach and the convenience and proximity of Jaco Beach this is without a doubt one of the best Hotels of Puntarenas, a secret jewel hidden in paradise. Manuel Antonio. Boutique, Adults Only, Romantic, Luxury Pool, Restaurant, Bar / Lounge. TV, Phone, Safe Box, Hair Dryer. Laundry Service, Concierge.